1939 Mercedes-Benz 770K Grosser Offener Tourenwagen – Scottsdale Auction. Nowhere in the automotive world is this type of political influence and social effect truer than in the case of this majestic, yet infamous 1939 Mercedes-Benz 770K Offener Tourenwagen – the “Super Mercedes” parade car used by none other than Adolf Hitler. Known alternatively as the “Grosser,” German for the “large Mercedes,” the 770K was also famous worldwide from introduction as the “Super Mercedes,” an almost otherworldly expression of Germany’s pride in the country’s characteristic and celebrated engineering prowess. Powered by a mammoth 7.7-litre inline eight-cylinder engine with overhead-valve architecture, the 770 was built in two distinct series – the W107 of 1930-1938, and the ultimate Type W150 from 1938 to 1943. Extremely expensive, obsessively engineered, robustly constructed and hand-crafted, the 770, whether in W107 or W150 form, was purpose-built to carry the most opulent and impressive custom-coachbuilt bodies ever devised and obviously intended for captains of industry and heads of state. Particularly in the case of the Type W150 cars, the market was global in scope for anyone possessing the required financial means, and factory brochures were produced in both German and English. Performance was massive, with the supercharged Type W150 cars easily capable of exceeding 100 mph (approximately 106 mph according to period road tests), a significant benchmark of the pre- and post-WW II years. While challengers of the period included Bugatti’s Type 41 Royale, 16-cylinder Cadillacs and Marmons, Packard Twelves, the 12-cylinder Hispano-Suiza and Lagonda, and Rolls-Royce Phantom III, the supercharged W150 770K (K=Kompressor or supercharger) was bested by none. Underneath, the W150 chassis was thoroughly modern, with oval tubular frame members for exceptional strength, rigidity, and resistance to torsional (twisting) forces. Independent coil-spring front suspension and a stable, parallel-wheel de Dion-type rear axle were derived from the mighty Mercedes “Silver Arrows” Grand Prix cars of the 1930s and delivered exceptional handling and passenger comfort. While sharing the basic engine design of its predecessor, the W150 was more powerful, having been tuned to develop 155 horsepower naturally aspirated and 230 horsepower with the “Kompressor” or supercharger engaged. 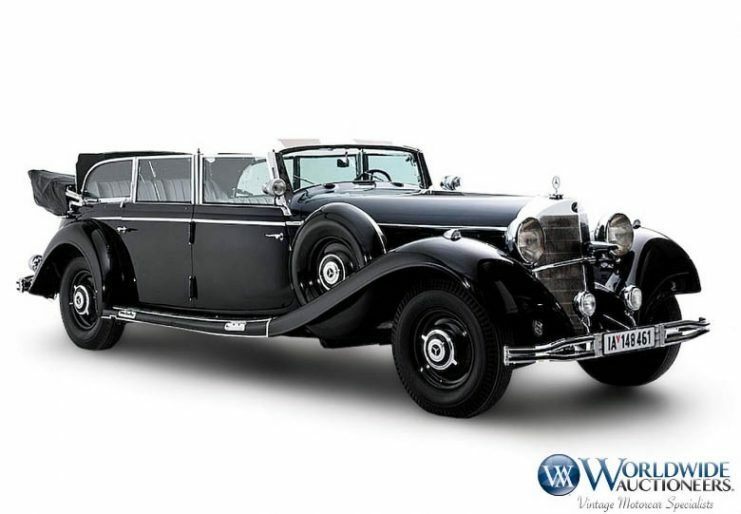 Four standard models of the “Super Mercedes” were catalogued by the factory, including the spacious Pullman Limousine with three-row seating, the elegant yet sporting four-door Cabriolet D, the more formal Cabriolet F, and the stunning Offener Tourenwagen (Open Tourer). All but the Cabriolet B are documented to have included a number of partially-armored examples with various levels of factory-specified armor plating and thick safety glass, plus 10 fully-armored Innenlenker-Limousine variants. In total, 88 W150 Grosser Mercedes 770s were built, through 1943 when the program was cancelled. All bodies were produced by the renowned craftsmen at Mercedes-Benz’s Sindelfingen Werks to predictably impeccable hand-built standards. Supported by incredible documentation and carrying exceptional provenance, the motorcar offered, and its history and integrity are beyond reproach. Numbered 189744, it is the product of the exacting requirements of Adolf Hitler and SS officer Erich Kempka, an early (since 1930) Nazi-party member who served as Hitler’s primary chauffeur from 1934. Kempka rose to the rank of Obersturmbannführer (Lieutenant Colonel) and would continue in Hitler’s service to April 1945. 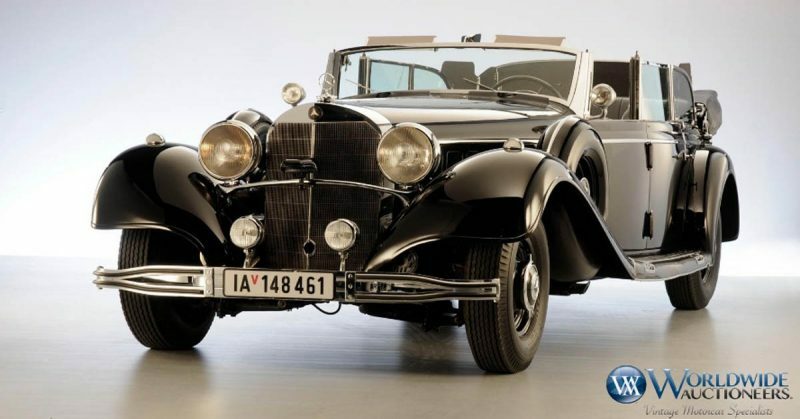 According to a letter on file dated September 2, 1938, this 770K was ordered at the request of Kempka for Hitler, captioned, “Commission number 303 305, Grosser Mercedes, open touring car W150 for the Führer and Reich Chancellor, fourth Führer-car.” This letter was issued directly from the Daimler-Benz Board of Directors to the Management of the Sindelfingen Daimler-Benz A.G. werks. As expected, the newest 770K for Hitler was superlative in all possible respects and at Kempka’s insistence, would provide maximum protection for his notorious patron and his chosen passengers, notwithstanding the limitations imposed by the Open Tourer body style with its folding soft top. Assigned Serial Number 189744, this 770K was intended from the outset as a guest car for Hitler’s garage when heads of friendly states visited. Kempka specified the finest details for the new 770K, the design of which was generally based on that of the car bearing commission number 266482, another of Hitler’s cars which was subsequently placed at the disposal of Luftwaffe chief Field Marshal Hermann Göring. Built-in security measures applied to 189744 were impressive and extensive, including 30-mm bullet-resistant laminated glass for the fixed windscreen, wind-up door windows and detachable side panels, with thoughtful finishing touches including neat covers for the broad slots when the windows were rolled down. Armor plating protected the body sides of the 770K and underneath the vehicle, and an armored panel at the rear of the car could be raised or lowered depending upon the perceived threat level, similar in design and operation to another Type W150 in Göring’s own impressive stable of vehicles. Jump seats and a removable rear windscreen provided additional passenger room as required. Assembly and delivery of the new 770K was requested as soon as possible. To facilitate its timely completion, the chassis frame for 189744 was selected from one of the first eight W150 chassis frames and prepared for right-hand drive. For clarity during the build process, Daimler-Benz executives, top management, and the Sindelfingen werks carrying out the project adhered to the practice of referring to the 770K only as the “fourth Führer-Car.” Despite the seeming urgency for the fourth Führer-car’s construction, a copy of the factory’s commission sheet (Komm-Nr. 303 305), reveals this Offener Tourenwagen was delivered to Berlin on July 29, 1939. On October 6, 1939, 770K 189744 made its public debut as part of a predictably large motorcade with a carefully orchestrated vehicle formation designed to maximize Hitler’s personal safety. During the proceedings, Hitler was delivered to the Old Reich Chancellery, with German and International media in attendance, plus representatives of the Nazi Propaganda Ministry’s Technical Services Department. The next high-profile outing for 189744 took place on June 18, 1940, when the 770K was used on parade in Munich for the state visit by Italian Fascist dictator, Benito Mussolini. On July 6, 1940, 189744 carried Hitler on his victory parade held in Berlin following the stunning defeat of France. On May 4, 1941, the last known and documented parade for this 770K ended at the Old Reichstag, where Hitler celebrated the German conquest of Yugoslavia and Greece – comparatively easy military victories that would be among Hitler’s last. On 15 July 1943, 189744 was sent back to Sindelfingen for maintenance at the factory. As is well-known, the disastrous German invasion of the USSR and the opening of a two-front war, compounded by British General Montgomery’s success against Rommel at El Alamein and the Americans’ Operation Torch landings in North Africa soon turned the tide against Germany. Heavy U.S. daylight bombing attacks caused heavy damage to key German industrial facilities, including all Daimler-Benz facilities, which suffered heavy destruction as prime and regular Allied targets. In particular, the company’s Mannheim and Sindelfingen werks were particularly hard-hit by the bombing raids. 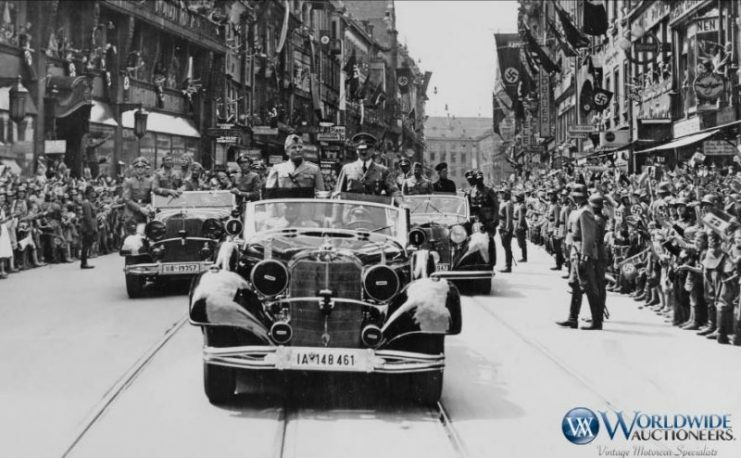 The time for lavish parades had passed for Hitler, and high-profile use of the majestic 770Ks in his motor pool declined sharply during the latter half of WW II in Europe. After the car’s return to Sindelfingen in July 1943, the wartime service of 189744 remains unknown. However, research conducted by the late Ludwig Kosche, who was a librarian and historian at the Canadian War Museum in Ottawa, which has long held another famous 770K, posited that it is well-known that Hitler did travel by road – quite possibly by 770K – to France for meetings with Field Marshall Rommel following the Allied invasion of France. Postwar, 189744 was captured by American forces and placed under the control and use of the U.S. Army Military Police stationed at the military motor pool located in Le Havre, France. This part of the car’s history is confirmed by two letters on file dated October 17, 1977 and November 4, 1978, written by former American G.I. Duane E. Briggs of Texas, who served at the Le Havre motor pool during 1945. After seeing a picture of this car published in the Houston Post in 1977, Mr. Briggs stated in his first letter that he “…recognized it right away as the one I had in my motor pool in Le Havre, France, for about 3 or 4 months. I put quite a few kilometres on it myself. I have a pretty good story to tell about the car myself. I knew a Frenchman who was a forced labor mechanic who worked on these cars.” In his 1978 letter, Mr. Briggs revealed that he was quite taken with the majestic 770K, and carried pictures of himself with the car in his billfold for many years after the war. Further in the letter, Mr. Briggs stated that at one point in 1945, a Colonel had attempted to export the car to the United States. The regal 770K did eventually make its way to the United States, via third owner A.H. Vander Elst, Jr. of Merksem, located near the busy shipping port and trading city of Antwerp in Belgium. He is understood to have acquired the 770K in 1946. Interestingly, Mr. Vander Elst was a principal in the tobacco trading and cigarette manufacturing family Vander Elst Freres, which operated Tabacofina S.A., maker of the world-famous “Belga” cigarette brand. Given the shortages and rationing driving demand and the value of cigarettes and tobacco products during and after wartime, Mr. Vander Elst sold 189744 soon after he acquired the car, reportedly in exchange for $1,800 worth of tobacco to Tom N. Austin, scion of the Austin tobacco dynasty from Greeneville, Tennessee. A veteran traveler who logged many Atlantic crossings by ocean liner during his career in the tobacco trade. The 770K was shipped to Mr. Austin’s home town of Greenville, North Carolina, and circa 1949, he donated the vehicle to his local branch (VFW 1990) of the Veterans of Foreign Wars, which used the car for a number of years in parades, carrying dignitaries and Gold Star Mothers who had lost sons on active duty. The new owners also engaged public relations firm Martin E. Janis & Company to vault the fascinating ex-Hitler 770K into the media spotlight, with many newspaper articles, radio interviews, and even a substantial story with the Associated Press ensuring nationwide interest in the vehicle. 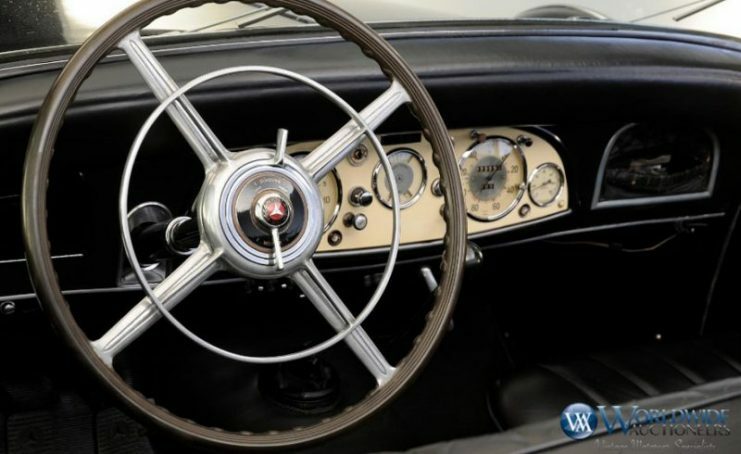 Following completion, the 770K was shown at several destinations around the country and was eventually displayed at the Chicago Historical Antique Automobile Museum Inc. in Highland Park, Illinois, which suggested a $1 million asking price for the car. The next owners were Earl and Tom Blakely, who acquired the 770K in September 1978 and registered the car in Georgia. On April 7, 1983, the 770K was sold to Ralph Engelstad, owner of the Imperial Palace Casino and Hotel in Las Vegas, the home to his famed Imperial Palace Auto Collection. Following the eventual passing of Mr. Engelstad in November 2002, 189744 was sold to a new European owner in 2004 as part of a 21-car package of significant Mercedes-Benz automobiles, the casino magnate’s unqualified favorite among all his many great classic vehicles. At the time of the sale of 189744 and the other cars in the package, this transaction marked the single most valuable private transaction in the classic-car world – a remarkable singular valuation that continues to stand today. Already recognized for its immense and unmatched historical significance, this Mercedes-Benz 770K continues to grasp and incite emotion in all who see and read about it. It can be reasonably stated that no other automobile is as widely recognized around the world. It has been viewed in the media, both in still photos and video and in historical reference books everywhere. Its life has been chronicled through its service during the war, and some 70 years beyond, where it has been in several displays and museums across the United States and more recently in some very significant and very private collections throughout the world. It is only proper that this incredibly important historical artifact now be offered so that it may be used in a setting such as a public museum or collection where it can be shown and used to continually educate generations to come. While much has been written over many years, perhaps no other historian has followed this rare breed more closely than the late Mr. Ludwig Kosche, a German resident of Canada and noted historian and librarian who worked at the Canadian War Museum in Ottawa, Ontario, where an ex-Hermann Göring Mercedes-Benz, (429344) has resided since 1971. Fittingly, his description of the car offered here – 189744 – ends with his most elegant summation of its place in history and society at large. For more information visit Worldwide Auctioneers. *It should be noted that 10% of the sale price of the car will be donated and used to educate how and why the Holocaust happened and how to effectively prevent such atrocities in the future.